Formally know as #5727, this poor horse had no name, no history, but an amazing story to tell. Early in October 2015, we were able to save another slaughter bound horse. Through a massive combined effort of many rescues and online social media communities, we found out about #5727 , a 14hh paint gelding with cracked feet and a mane full of burrs. He was owned by a Kill Buyer but was being pulled aside, along with 10 other horses. Even though our facilities were full at the time, we knew we had to do something. We secured a place at a Quarantine Facility in PA until we could pick him up, and therefore, we were able to step in and save him. So many people were involved just to save this one horse… one number…number #5727. 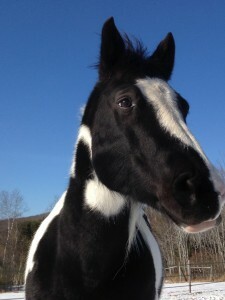 We affectionately called him Oreo due to his markings and he is just as sweet as Oreos come. He is approximately 8 years old. 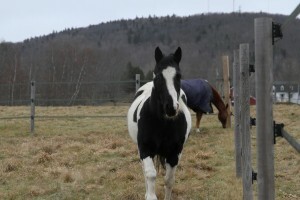 Oreo came to the farm along with his new friend Charlie, in December 2015. He is progressing well in his retraining and now W/T/C under saddle. We have also taken him out on trails and several off the farm field trips. Update: Right on the heels of Roman’s announcement, we have more good news to share with all of you. Oreo has found his forever home and has formally been adopted. This slaughter bound horse was saved in October 2015. The sad and scared 14hh paint gelding had cracked feet and a mane full of burrs. He was owned by a kill buyer but was pulled by Kris Young, along with 10 other horses. Even though our facilities were full at the time, we knew we had to do something. We found a secure quarantine facility called Misty Spring Stables in Ringtown, PA. The owner, Linda McCormick looked after him until we picked him up along with his new friend Charlie in December 2015. We affectionately called him Oreo due to his markings and he is just as sweet as Oreos come. He didn’t seem to know much at first, but absolutely loved the fact that these humans were paying attention to him, providing him with nutrition, grooming and truly cared about him... something he had obviously been lacking for a long time. He progressed well in his retraining and demonstrated he was eager to please. We knew we had to find the right person to provide Oreo with the care and attention that he truly deserves. That is were the Chapmans came in. At the same time that Oreo was being saved, we were adopting out Austin to his forever home. Laurie expressed how she also wanted a horse for her daughter and how Austin would need a friend. We discussed our options and agreed to keep an eye out for the right fit. After Oreo was here for a while it was clear that this was the horse and that the Chapmans were the right people to fill the void in Oreo’s life. Austin and Oreo became friends the second Oreo stepped of the trailer. They both have very laid back personalities and were grazing next to each other within a half hour. Congratulations to the Chapmans on adopting Oreo. We are grateful for their patience during Oreo’s retraining process and for taking in a second rescue. We wish you many happy trail rides and many years of affectionate companionship.